The remarkable and stupendous band DVICIO has and continues to take the entertainment world by storm in such an awe-inspiring way. From their outstanding music to their exceptional performances, fans worldwide can’t help but catch the DVICIO fever. One thing about the internationally acclaimed band, whose band members include Andres Ceballos, Martin Ceballos, Alberto Missis, Nacho Gotor and Luis Gonzalvo, is that whenever they release a new project of theirs, it’s always bound to be a musical masterpiece; so when the band announced the release of a very new song of theirs, we all knew that it was going to be absolutely breathtaking, and breathtaking it surely is! We all have been listening to DVICIO’s album, “Justo Ahora” ever since it came out, but we have definitely been eagerly waiting to hear new music from the immensely talented band. Well, the day has finally arrive as the extraordinary band’s brand new single “Casi Humanos” has officially released and we can’t stop listening to it on constant repeat. Yet again, DVICIO has managed to leave us all speechless with such an exceptional song. “Casi Humanos” has such a spectacular beat to it and heart-warming lyrics that will make you fall in love and fall in love deeply. In fact, DVICIO had a special way of celebrating the release of their single by having a worldwide takeover with influencers from various places across the globe including Thailand, Mexico, Argentina, and more to share snippets of DVICIO’s song and complete the song as it is officially released at midnight in Madrid. Upon completion of the exciting celebration, DVICIO shared the outstanding video as seen below on their Instagram account. DVICIO band members shared their excitement over the release of their new single as seen below. Here at Alexisjoyvipaccess.com, I’d like to send a big congratulations to DVICIO on such a sensational, new single! 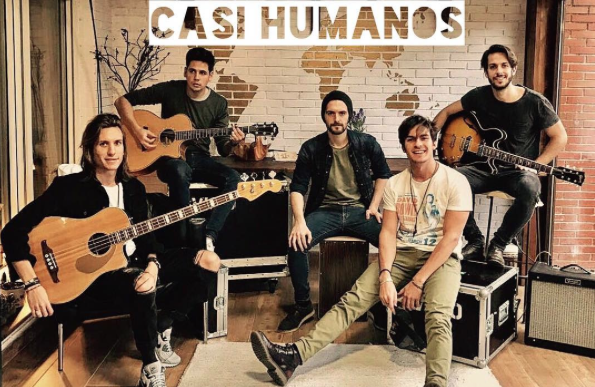 Be sure to listen to “Casi Humanos,” DVICIO’s new masterpiece on iTunes and Spotify and don’t forget to share it around to all of your friends and family on all of your social media networks! Follow DVICIO on Twitter: @dvicioficial and on Instagram: @Dvicio and follow @dvicio_andres, @dvicio_missis, @dvicio_martin, @dvicio_luis, and @dvicio_nacho on Twitter and Instagram and watch our VIPAccessEXCLUSIVE interviews below! Previous VIPAccessEXCLUSIVE: The Genius Butch Hartman Talks About His New Show “Bunsen Is A Beast” In His Interview With Alexisjoyvipaccess! Next Article: Syd Wilder Had A Fantastic Time At Her Buffalo Wild Wings Times Square Appearance!